Coffee Mate Cinnamon Vanilla Creme Liquid Creamers. Comes in an attractive box suitable for display. 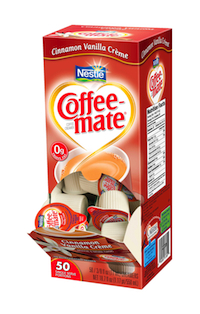 Each box contains 50 individually sealed cup size servings of delicious coffee-mate cinnamon vanilla creamer.